For those of you who aren’t familiar with the groundfish debacle in New England, Mr. Shelley and the CLF, utilizing the court system and a whole bunch of money (according to their IRS Form 990 filed in 2011- the last year available on the Guidestar website – total CLF revenue was $5,800,000, up $1,250,000 from the year before), have been playing a pivotal role in the groundfish fishery management program via the management process and the courts since before it was a debacle. Evidently the groundfish fishery wasn’t enough to fill Mr. Shelley’s plate so he has been involved in Atlantic (sea) herring management as well. Part of that involvement was an opinion piece on the CLF website titled New England’s Fishing Pathology, referring to the participants in and their participation in the Atlantic herring fishery – or at least those people whose participation involves boats bigger than those that Mr. Shelley has decided are too big. I’m going to start off with a primer on Atlantic herring management. This should make it easier to put Mr. Shelley’s words in their proper context. The Atlantic herring fishery in U.S. waters is divided into four distinct management areas designated 1A, 1B, 2 and 3. Each year a quota (actually an Area Annual Catch Limit) is determined for each area. Area 1B has by far the lowest quota of all four areas (Area 1A is 33,031 metric tons, Area 1B is 2,878 metric tons, Area 2 is 28,764 metric tons and Area 3 is 39,415 metric tons). Area 1A, adjacent to Area 1B, is primarily populated by the Gulf of Maine herring stock, Area 3 by the Georges Bank herring stock and Area 1B and Area 2 are populated by a mix of herring from both the Georges Bank and Gulf of Maine stocks. Limited access herring vessels report catch daily via VMS (Vessel Monitoring System), open access herring vessels report catch weekly via the IVR (Interactive Voice Response) system, and all herring ‐ permitted vessels submit VTRs (Vessel Trip Report) weekly. Failure to submit reports, including the requirement to submit a negative VTR for any week when no catch was made, has resulted in vessels being referred to the NOAA Office of Law enforcement for investigation. 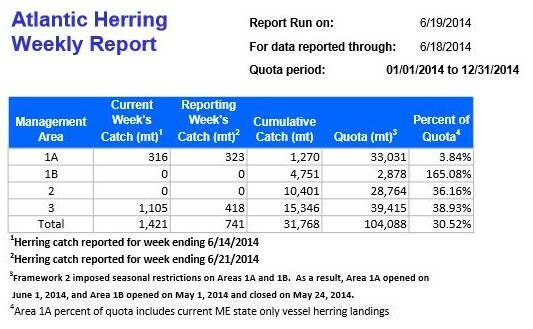 – From the NOAA/NMFS Atlantic Herring Weekly Reports. The reports are processed by NOAA/NMFS and when 92% of the quota for a particular area is reached the directed fishery in that area is closed. If it is required that an area be “closed” to harvesting (actually the area isn’t closed but the trip limit is reduced to a very low level) it is the responsibility of and is done by NOAA/NMFS. It is intended that this be done in a timely manner to avoid significant overages in harvest. Apparently this is not always possible. If there is an overage in an area in a given year that overage is subtracted from that area’s quota in subsequent years. The entire directed fishery for herring is closed when 92% of the entire quota (104,088 mt for this fishing year) has been harvested, from all areas, collectively. There is nothing in the Fishery Management Plan requiring – or even suggesting – that it is a responsibility of the vessel owners/operators to do anything more than or to be in any way responsible for more than their own vessels’ reporting. Once a vessel owner/operator meets the daily and/or weekly reporting requirements he or she has met his or her responsibilities until or if fishing in a particular area is shut down by NOAA/NMFS. If a vessel continues to fish in an area that has been closed or has more than the 2,000 pound trip limit aboard that fact will become obvious to NOAA/NMFS through the VMS and appropriate action will be taken. Mr. Shelley’s column is based on the fact that in one of the four Atlantic herring management areas, Area 1B, the big boats that he somewhat puzzlingly refers to as part of a commodity-style fleet* exceeded their quota by 60%. One of the things that he neglected to mention was that with almost 6 months of the 2014 fishery completed the Atlantic herring harvest from all areas was only 30.5% of the quota. While an overage of any area is of concern from a management perspective, it’s highly unlikely that the Area 1B overage has significant biological implications. The last Atlantic Herring Stock Assessment, held in January of 2011, estimated the total biomass at 1,322,446 metric tons. The Area 1B overage was between one and two tenths of one percent of that and less than 2% of the total quota for all four areas. On the following page is a table (from data provided by the New England Fishery Management Council staff) which shows the annual maximum catch (quota) allowed for each of the four management areas, the actual catch from each of those areas, and the percentage of the quota taken from each area in each year for the past ten years. Note that over the past decade the participants in the herring fishery, participants who Peter Shelley and the CLF have termed “bad fishermen” who are in their estimation suffering from some undisclosed pathological condition, and I guess characterized by a lack of regard for either the fish they harvest or of their fellow fishermen, have caught only 70% of the quota from all four areas. Note also that in Area 1B, the area which went from a minor mole hill in any general herring quota analysis to Mr. Shelley’s supposed catastrophic mountain travelling at 104 mph, the percentage of total quota taken each year has ranged from a low of 19% in 2009 to a high of 158% in 2012, with no apparent trend. Two of the three other areas demonstrate similar swings in harvest percentage with no apparent trend. In fact the only area that demonstrates any consistency is Area 1A, and not coincidentally that is the only area in which the average landings have equaled 100% of the quota. In this area the Atlantic States Marine Fisheries Commission’s Atlantic herring plan allows the states of Massachusetts, New Hampshire and Maine to work cooperatively with seiners and trawlers in the Gulf of Maine to tightly manage the 1A quota by limiting fishing days during each week, in order to stretch the quota out through the fishing year and provide a consistent supply of herring to local lobster bait markets. Of this supposed pathological condition Mr. Shelley wrote “the herring fleet has blown past the quota in that same area several times before.” He could as easily, and perhaps more accurately, have written that the herring fleet has significantly underharvested the Area 1B quota in seven of the past ten years (it looks like 90%, 79%, 130%, 73%, 89%, 19%, 138%, 81%, 158% and 53% since 2004). Some pathology! In spite of what seems to be from a conservation perspective an overall stellar performance by everyone associated with this fishery, particularly in the face of a resource base that seems to be bouncing all over the Northwest Atlantic from month to month and from year to year, Mr. Shelley picks out the performance in this particular area that contributes less than 3% to the total quota, an area in which the quota had been off in two of the last ten years by at least as much as that which precipitated the current episode of strum und drang, and with an overage that will be deducted from the future area quota. He then takes another stab at the participants in the fishery in general and on Mid-Atlantic and New England Council Members associated with the fishery in particular, writing “I have yet to come across an ounce of mea culpa or even regret from the herring fleet, its representatives, or any of the seafood industry bloggers.” Maybe because neither they nor I (I assume I was included as a seafood industry blogger), being aware of the whole fishery rather than of the cherry-picked bit that he focused on, saw any necessity to publicly gnash our teeth, tear our hair, rend our garments or do anything else that would satisfy his seeming need for some public display of guilt and remorse on our collective and individual parts. The people in the herring industry followed the rules, and followed them in a timely manner. If the management system broke down none of the culpa for that belongs with any of us. With only a sixth of the quota being taken from the coastal stock complex of Atlantic herring to date this fishing year about the only regret I can feel is for the beleaguered fishing communities – beleaguered, I might add, in large part due to the efforts of groups like the CLF and people like Mr. Shelley – that are going to have to forgo the income that those uncaught herring would have generated. I’ll leave it for you to decide whether all of the smoke surrounding the Atlantic herring fishery has been generated by an actual crisis or by the well-oiled, foundation supported smoke machines that have become increasingly prevalent in fisheries/oceans governance for most of the last two decades. *A commodity is defined as anything that is bought or sold. While whether Mr. Shelley thinks that fish and shellfish should not be sold by commercial harvesters is not clear here. I’ll assume that he doesn’t, that he couldn’t find the right word or words that would be suitable so took a wild stab.